I just stocked up on yet another gigantic container of incredibly inexpensive, non-toxic white vinegar. We use vinegar mostly for cooking and cleaning purposes in our home. It's a simple solution made up of mostly acetic acid (produced by fermented grain) and water. #1: All-Purpose Cleaner -- Just fill up half a spray bottle with vinegar and the rest with water and maybe a few essential oil drops. Give a good shake and use for cleaning countertops, tabletops, and -- really -- anywhere else. #2: Window Cleaner -- I add a bit of alcohol to the all-purpose mix (a few tablespoons works -- I make a smaller spray bottle of it for this purpose) and that helps windows stay streak-free! #3: Dish Rinse -- I mentioned in our 5 Green Cleaners That Actually Work post that we make our own dishwasher detergent. We fill our rinse basin with vinegar mixed with essential oils. Works like a charm. #5: Laundry Boost -- I often add 1/2 cup of vinegar to our laundry loads. It helps preserve colors, works as a fabric softener, helps rinse detergent clean, and even lessens static cling! #6: Drain De-Clogger -- If I notice a slow drain, I combine 1 cup of baking soda with 2 cups boiling water plus 1 cup vinegar. You'll get some bubbling action that might encourage those clogs to stay clear. #7: Pots + Pans Cleaner -- We have a few stainless steel pots and pans, and they're always attracting burn marks and grime. I'll do a separate post on this one, but I put around 1 cup of vinegar with a couple tablespoons of baking soda and additional water in the pan and bring to a boil. Then I wipe it out with a cloth! #8: Microwave Cleaner -- We pulled our microwave back out again now that we have space. And cleaning it is easy! I put 1 cup of water plus about 1/4 cup of vinegar inside and heat for around 5 minutes on high. Then I just wipe out with a cloth. #9: Disinfect Cutting Board -- This is a biggie! Instead of using my all-purpose cleaner on our cutting boards, I use full strength vinegar to disinfect after each use. A little splash goes a long way. #10: Sticker Stopper -- Have a sticker stuck on your floor or someplace else? Soak the thing with vinegar for 15 minutes and then remove with your nail, a coin or credit card. #11: Bathtub Cleaner, Etc. -- I also use full-strength vinegar in our bathroom for most cleaning (tub, tiles, shower surround, sink. For tough jobs, I combine with our natural scouring scrub. #12: Freshen Clothes -- I wrote an article titled You're Washing Your Clothes Too Often! (What To Do Instead), and ever since -- I've been going longer between loads. If I've only gently worn something, I sometimes spritz it with a mixture of 1 part vinegar, 3 parts water and essential oils of my choosing. It acts like a fabric softener. Again, the initial vinegar smell dissipates. #14: Cat Deterrent -- I'm not 100% sure this works yet, but we've started using a little vinegar spritz as a deterrent for our cats to stay off our leather couch and dining room table. I hear it also works outdoors in gardens, etc. Here's where I found this trick. #15: Ant Deterrent -- I discovered this trick when I was researching an article for Wise Bread. Basically, if you see a trail of ants entering your home, spritz the path with a 50/50 mix of vinegar and water to erase their scent trails. You can pick up a big jug of distilled white vinegar at your grocery or hardware store. I actually found our cheapest bet at Lowe's the other day -- and it was specifically a cleaning grade kind. Otherwise, you might notice a lot of spritzing and spraying. 3-pack of 24-ounce Sprayers -- This pack is helpful if you want to have a couple different dilutions at your disposal. For example, you could make one up of the all-purpose cleaner, the laundry/veggie wash in another, and window cleaner. Just label clearly so no mix-ups! Glass Spray Bottle -- If you'd prefer to go the glass route, this bottle looks like a great buy. It has two different spray settings (mist or stream). Essential Oils -- Pretty much any essential oil will go well with vinegar. Yeah, the vinegar adds another note to the scent. I like using lavender, peppermint, and eucalyptus. I use lots of essential oils in cleaning to enhance the antimicrobial properties and add pleasing scents, and it only take a few drops! 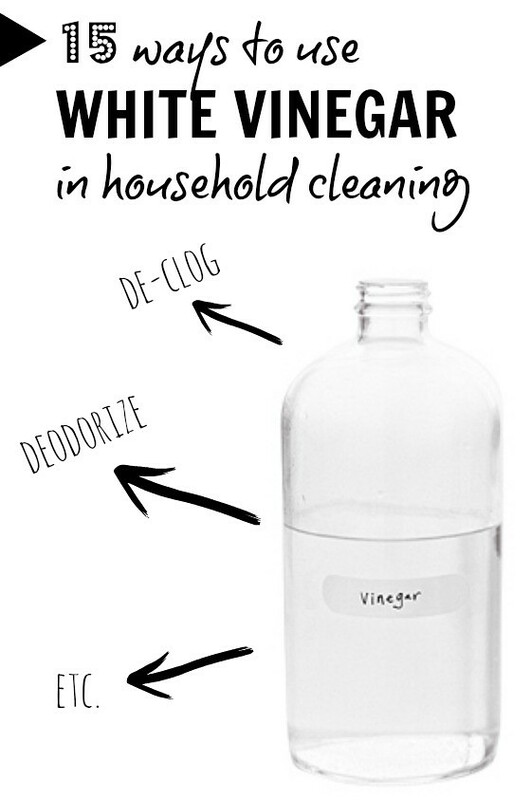 What's the craziest way you use vinegar in home cleaning?